Tangela Large in “Mr. Joy,” presented by ArtsEmerson. Currents of urgency run through Daniel Beaty’s “Mr. Joy,’’ a solo play at ArtsEmerson that exhorts us to pay attention: to racial and economic injustice, to a generation of young men who feel adrift and forgotten, and to our common humanity, too often overlooked in the struggle of daily life. 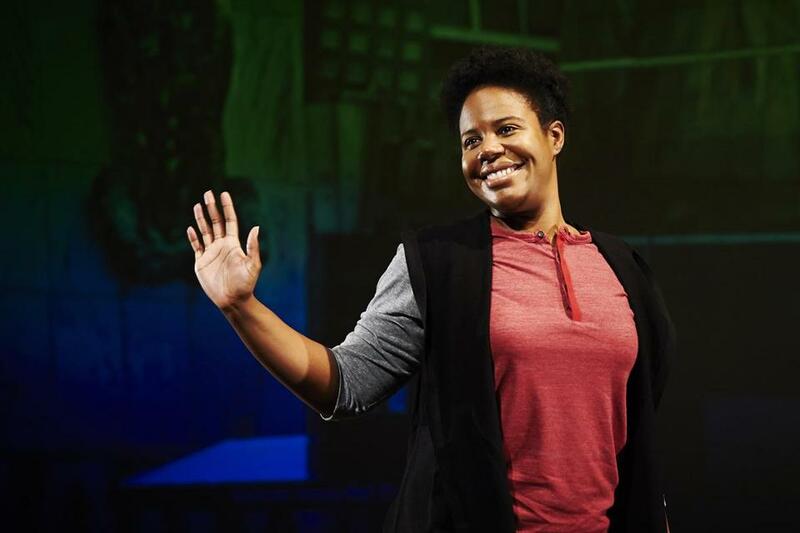 It’s a message delivered in multiple voices, all of them channeled by Tangela Large, 27, a talented actress who portrays more than half a dozen New Yorkers connected in some way to the play’s title figure, a Chinese immigrant who for decades has run a shoe-repair shop in Harlem. When this popular and respected figure is brutally assaulted (an event that is referred to but not depicted onstage), it sends shockwaves through the neighborhood. Though Mr. Joy knows who attacked him, he hasn’t identified his assailant to the police. Why not? That’s one of several pressing but not easily answered questions that arise in “Mr. Joy,’’ which is helmed by David Dower, the artistic director at ArtsEmerson, who also staged Beaty’s “Breath & Imagination’’ earlier this year. To anyone who saw Large in a 2013 Trinity Repertory Company production of Christopher Durang’s “Vanya and Sonia and Masha and Spike’’ — in which she played Cassandra, the allegedly psychic housekeeper — her dexterity is no secret. The actress was wonderfully funny in that role. In “Mr. Joy,’’ Large is obviously traveling across far more complicated territory — and it’s an absorbing journey to watch. Transitioning in an instant from one character to the next, Large delivers portrayals of figures as different as Clarissa, an endearingly ebullient young girl who aspires to be a shoe designer and is matter-of-factly coping with AIDS; Bessie, Clarissa’s fiercely protective grandmother, a lifelong Harlem resident who was hostile toward Mr. Joy before she got to know him; DeShawn, a teenager radiating excitement at the chance to recite his poem in church but troubled by “how fast life can change in these streets’’; John Lee, Mr. Joy’s son, a real estate developer; Ashes, a transsexual flight attendant; and Clifford, a conservative Republican who is the father of Ashes and John Lee’s boss. To each of these characters and others, Large brings a distinctively individualized personality as she moves about the Jackie Liebergott Black Box Theatre while a screen behind her (projection design is by Josh Lehrer) delivers images of Harlem and its residents. The set consists of storefront steps on which sit numerous pairs of shoes, plus some flowers, laid there by residents as gestures of concern for Mr. Joy. Playwright Beaty, the artist in residence at ArtsEmerson, and director Dower have immersed “Mr. Joy’’ very much in the present moment. Issues like immigration, gentrification, ethnic tensions, gang violence, and police brutality are woven throughout the piece, which is also spiced with references to public figures like Viola Davis, Caitlin Jenner, Laverne Cox, and Dr. Ben Carson, the GOP presidential hopeful. “Mr. Joy’’ is most effective, though, not in its ripped-from-the-headlines scenes but in its far-from-the-headlines moments, such as when an anguished DeShawn describes to a friend how a young man in the neighborhood was thrown by gang members from the 36th floor of a building because he happened to check out one of their girlfriends as she walked by. “Mr. Joy’’ itself is a pretty good step in that direction.